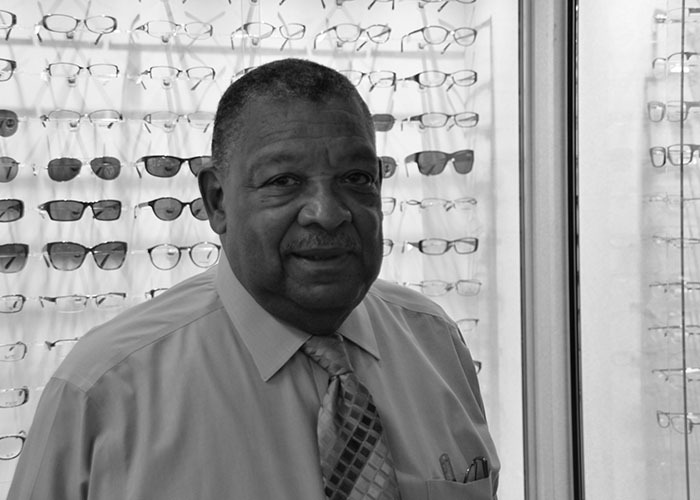 Optician Delmar Nelson has owned Crest Opticians for 50 years. If Purple Line plans fall through, this will be his third time relocating for a capital project. This is Part 4 in the series “Purple Line Divided” by the Capital News Service. The $5.6 billion Purple Line light rail project is moving ahead, but not without hardship for some residents and business owners. Optician Delmar Nelson sits alone in his office many afternoons. Just outside the door, rows of untouched eyeglasses sit in displays illuminated by yellow lights. No one walks into his store. Business has been like this for a while, he says, and he doesn’t expect things to get better before the Purple Line deal is done. Nelson, the owner of Crest Opticians in Silver Spring, said he has seen fewer customers and more down time since Gov. Larry Hogan announced plans to move forward with the Purple Line project — a 16-mile light rail with 21 stops connecting Montgomery and Prince George’s counties. Between late winter and May, he said, business has gotten worse as more people have heard the shopping center is doomed. An August 2013 Purple Line impact statement showed that an estimate of 60 businesses and 246 employees in the state of Maryland will be displaced. In Silver Spring alone, close to 40 businesses and more than 140 employees will be displaced. Nelson is one of them. The $5.6 billion transit project is set to obliterate the Spring Center shopping center at the corner of 16th and Spring streets, where Crest Opticians is one of 20 businesses that will have to make way for the line. According to the state transit administration, the Maryland Department of Transportation has spent $19.3 million on all property acquisition activities for the Purple Line through October 2015. An estimated total of $263.5 million has been budgeted for property acquisitions between the 2016 and 2021 fiscal years. The 79-year-old said he has been on edge ever since people from the Purple Line came to his shop and handed him a folder. They explained the new project and assigned him a counselor whom he could call if he had questions, he said. That was more than three years ago. Since then, Nelson had one meeting with them this month, and found out that in June or July they will likely reach a settlement with the mall owners and he will get a letter stating his lease is nullified. Only then will he qualify for assistance from the state. Nelson knows that as a resident of Washington, D.C., his living situation won’t be affected, but his business is at a standstill. Without a location, Nelson can’t move forward, and he’s not sure whether he wants to. “This should be a time where I could sell my business, but because of the Purple Line, I can’t get a sale,” said Nelson, who has owned the shop for 50 years. Neighboring franchise business Signs by Tomorrow has been a facet of the Spring Center for 22 years, making signs and banners for businesses and people in the community. Owner Deborah Hyman, 63, wants to make renovations to her shop, but she, too, is waiting for an offer from the state. While property acquisitions in any state project put pressure on business and homeowners, Sandy Arnette, spokeswoman for the Maryland Transit Administration, said that it’s an important step in any construction project. But Hyman said she doesn’t know where she will move. Signs by Tomorrow must stay in Silver Spring in order to fulfill Hyman’s agreement as an owner of the franchise flagship, and the area has become a hotspot for businesses, making retail space hard to find. Hyman also said neighbors to the shopping center will now have fewer choices when it comes to food, since restaurants like Spring Garden and El Aquila will also be displaced. The shopping center has a total of 20 businesses, including Dollar Power, Jerry’s Subs, Spring Discount Beer and Wine, SS Package and Shipping, 7-Eleven, Famous Pawnbrokers, Kessler’s Dry Clean, Cameron’s Seafood, a beauty supply store and a laundromat. Hyman says despite the impact on her business, she sees the positives of the Purple Line. The Purple Line will connect to the red, green and the orange Metro lines, as well as all three MARC Train lines and Amtrak. The light rail is also projected to create more than 23,000 jobs within the state over six years, and increase access to major job centers, including the University of Maryland, College Park; downtown Silver Spring; and downtown Bethesda, according to the Hogan administration. “I just don’t think the retail aspect of this endeavor is being addressed, because we’re too small. We can’t have a voice, because we can’t pay for somebody to be our voice,” Hyman said. Hyman has been working closely with a right-of-way specialist from Diversified Property Services, which has been approved by the transit administration to appraise her space. This is the only way she can get the promised money from the state for relocating. The maximum business owners can get to re-establish their businesses at a new site is $60,000, according to the Maryland Transit Administration’s Relocation Assistance Program brochure. Hyman says it’s not enough to cover costs to re-establish her business. The Spring Center businesses are not the only ones that are worried. Carlos Perozo, president of the Long Branch Business League, said that when owners of Long Branch businesses — on Flower Avenue, Piney Branch Road, University Boulevard and Arliss Street — learned about the Purple Line coming to their area, they reacted as if the sky was falling. Perozo said the Maryland Transit Administration gave a presentation to the league last year, explaining how the project was going to affect their community. A tunnel for the light rail would run under Wayne Avenue and an entrance would be created for a new light rail station, Long Branch, which will be located on Arliss Street, and another nearby station, Dale Drive. That means construction could take place on Arliss Street and head west on Flower Avenue for a couple of years, likely causing congestion on the streets leading up to nearby businesses. Perozo, who owns ZP Tax on Flower Avenue, said the business league researched the effects of similar transportation projects that have happened around the country. They found that in addition to construction deterring customers from patronizing their businesses, it was likely that the Purple Line would increase the cost of rent for nearby homes, apartments and businesses, Perozo said. Soon after, Perozo and 42 other business owners joined the Purple Line Compact, a coalition focused on creating dialogue and communication among stakeholders in the transit project and the community. Perozo, originally from Venezuela, said that at a neighborhood block party hosted last year by the Long Branch Business League, he found that more than 20 countries were represented within the Silver Spring neighborhood. With people from the Philippines, India, Korea, China and the Dominican Republic — half of them owning restaurants in the area — Perozo said he fears that the Purple Line will bring gentrification, and with it increased costs of living and of doing business for hard-working immigrants in the area. According to the 2010 U.S. Census, 27 percent of Long Branch’s population are African American, 5 percent are Asian and 29 percent are Hispanic. Fifteen percent of the population define themselves as “other,” and the remainder are Caucasian. Delegate Ana Sol Gutierrez, D-Montgomery, a proponent of the Purple Line, said she believes that rising costs of living and property values are inevitable. But Gutierrez said the possible rise in costs as a result of the new transit line is not a “Purple Line problem” — it’s a problem of affordable housing. Gutierrez said that she would urge local governments to prioritize a study on what the options are for people being priced out of the area. Otherwise, Gutierrez said she sees the Purple Line as “a social justice win-win,” especially when she thinks of the thousands of people that have to take one, two or three buses to get to work. The Purple Line will help lessen the commute time and effort. Connecting Bethesda to New Carrollton, the light rail is projected to see as many as 74,000 total daily riders by 2040, according to the Maryland Transit Administration. The Purple Line will especially work in favor of a large segment of the population who are low-income, particularly Latinos or immigrants who don’t have access to fast, reliable transportation to go to and from jobs, Gutierrez said. As a local businesses owner in the metropolitan area, optician Nelson realizes the need for public transit, but the third time’s a charm. His 50-year-old business has been relocated twice before while he ran his business in Washington. 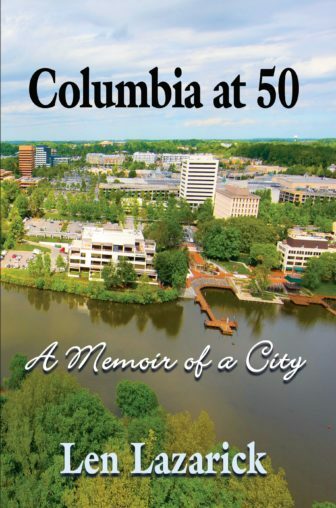 After the second time, he decided on Silver Spring in hopes of settling there for good. Now, Nelson said, the uncertainty has been hard. But progress is happening. The Maryland Department of Transportation selected Purple Line Transit Partners, consisting of Fluor Enterprises Inc., Meridiam Infrastructure and Star America Fund, in early March to design, operate, finance and maintain the Purple Line. Until Nelson sees it in writing, he’s playing a waiting game, he said. “I’m just here marking time. You can’t invest in a business while you’re waiting,” Nelson said. MarylandReporter.com Associate Editor Meg Tully contributed to this report.